Soon after the Libyan rebellion escalated, a senior member of the nation's powerful Warfallah tribe announced it would no longer support Moammar Gadhafi, saying that "he is no longer a brother." Gadhafi needs to go now, before more people are killed. Oh Yeah! His people really love him. don't they? Very interesting article. I had no idea there so many of these tribes in Libya, and the strange role they play..
Way too many casualties, let's all hope that this butchery will end soon. And that afterwards things will go better. We all need to look a bit closer at what is actually happening in Libya. The U.N and N.A.T.O are ready to pounce and invade the country and gain control of its oil ..Reading more independent news reports, the "facts" stated by some of the western media are false, and are engineered to justify an invasion. 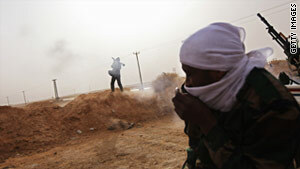 Reports that it is not Gadhafi's army attacking his own civilians, and ammunition depots. Also where is the evidence of rioting in the street's. Some People who were forced to leave Libya, say that when there was a bread shortage, food was supplied within 3 days by Govt.. Their area was peaceful and quiet. There are wide spread reports that every one is just carrying on as usual. Except for some apparent "insurgents" funded by whom ? But its a good ruse to get people on their side's for a so called "Humanitarian" exercise. Sorry folks but I have trouble buying into this...Is this the "W.M.D of Libya..? My heart and hopes go out to the Libyan people! I hope the Libyan people get rid of Gaddafi. Noted.We have to remember that Qaddafi is not the only person who commits crimes against humanity.The Israeli Zionist leadership,IDF and IDA are committing a similar crime daily against the Palestinians Before and after 1948 and up till this moment.Don't forget the Zionist terrorist gangs like shteren and Hagan-ah beside criminals like Ariel Sharon and Netanyahu. If Qaddafi will be thrown down by his people,the day will come when Palestinians restore their land,homes and property from the Zionist entity.Wait and see. Right now they see the central government as the enemy. Once he is removed, they will have to come to the realization that they have to stay united or large corporate influences will continue to control their country. They have to remain as one to keep what is theirs. Docmocracy is on the upswing, no doubt. Muslim leaders may want to restrict the populace, but the people want freedom. We can thank the innovation of the internet, for this progress. Gee, what will the conservatives have to say about this? What will happen to their theory, "Muslims want to take over the world"? As we speak, people everywhere want their fair share, which has been denied them. Charlene, the concept of Islam taking over the world is limited to Jihadists, not to all Muslims. Moderate Muslims recognized that Capitalism and Democracy is the best life style possible now, and are grateful to non-Muslim countries where they live. Islamists may live in a place for many years and still be willing to kill their neighbors just because they are of different religion. It is encouraging to see Arab states getting rid of their dictators. Hopefully, democracy and not fanaticism will spread over the Middle East.